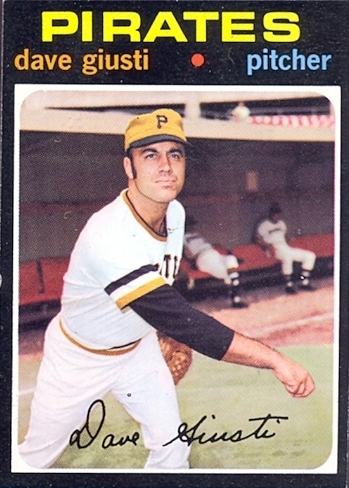 On April 20, 1970, at Forbes Field in Pittsburgh, a new pitching role was initiated for Dave Giusti. That Monday night, Dennis Menke of the Houston Astros stepped into the batter’s box to face Dock Ellis of the Pirates. Within a few moments, Menke smashed a line drive through the pitching box. Unfortunately, Ellis’ right hand got in the way as he attempted to stop the hot smash. The ball continued into center field for a single, tying the game at 1-1. Ellis left the game after completing the top of the sixth inning. Willie Stargell clouted a monstrous two-run homer in the bottom half of the inning, giving Pittsburgh Pirates a 3-1 lead. Danny Murtaugh, the Pirates skipper, elected to replace Ellis with Dave Giusti, whom the Pirates acquired with Dave Ricketts and minor leaguer Frank Vanzin for Carl Taylor from the Cardinals during the off-season. The new Pirate pitcher went on to blank the Astros for the last three innings preserving Ellis’ second victory of the season, while recording his first save as a Pirate. This game signaled the beginning of Dave’s career as a relief ace. Nineteen-seventy was Dave’s first season with the Pirates. His spring training was not impressive, and he was penciled in for the bullpen. Originally Murtaugh envisioned him as a “swing man” on the staff, handling both starting and relieving. Dave was born to David and Mary Giusti in Seneca Falls, New York, on November 27, 1939, older of two sons. Dave began playing baseball between the ages of four and five. According to his wife, the future big leaguer’s first word was “ball,” but his sports career path was probably due to family genetics. His father played semi-pro baseball around central New York State, but stopped playing when Dave was born. His uncle was John Pannucci, who played baseball and football at Syracuse University from 1954 to 1957 and was the backup quarterback during the Jim Brown era. John like his nephew was the captain of his baseball team his senior year. Dave played organized sports during his youth. He grew up quickly and was big for his age. He started shaving at 12 years old. His early facial hair forced him to carry around his birth certificate when playing games outside of where he grew up. He played on a Little League team that went to the sectionals. When he was fifteen years old, his team lost in the New York State Babe Ruth Championship by a score of 1-0. The opposing pitcher was Carl Yastrzemski, future Hall of Famer and 1967 Triple Crown winner. Yaz also scored the only run in the game. Giusti sill laments that a ball he hit off Carl was a home run although it was ruled a ground rule double. While pitching in that game on April 20, 1970, might have ushered in Giusti’s career as a closer, his journey towards the majors can be traced back to 1961 in Syracuse. Dave played both baseball and basketball for the Orangemen of Syracuse University. His senior year in 1961 was special for both Giusti and the Syracuse baseball squad. The team was considered a long shot for the NCAA Tournament even after a successful regular season. The Post-Standard of Syracuse reported how the team needed to win all three games during the final weekend of the regular season to force the tournament selectors to look seriously at them. The rotation consisted of Jeff Williams against Bucknell, followed by Giusti and Bill Connors against Penn State. Syracuse took all three games, including a 10-0 gem by Giusti. In that game he struck out seven while walking one. He contributed at the plate with three hits and three runs batted in. Many felt that he might have been drafted for his bat. Connors also won. Dave followed Connor’s victory with a one-hit gem on June 2nd against the University of Delaware. The team went on to defeat St. Johns of Brooklyn for the District Two NCCA Championship. This earned them a plane flight to Omaha for the College World Series. Colorado State College was their first opponent, a team making their fifth straight appearance in the tournament. The Orangemen won 12-5. Giusti then eliminated Western Michigan with a four-hit, 6-0 shutout. Unfortunately, Syracuse’s run ended against powerful Oklahoma State, who sent them home with an 8-0 thumping. Dave played third bas that day.. His brilliant college career finally came to an end. On July 18, 1960, responding to the threat of a new major league, both the National and American League decided to add two more teams. The American League expanded for the 1961 season with the addition of the Los Angeles Angels and Washington Senators. The National League expanded the following season with the Houston Colt .45s and New York Mets. Houston signed Dave Giusti on June 16, 1961, shortly after the end of his college career. Spook Edwards, a former Pittsburgh Pirate signed him as an amateur free agent. Giusti received a $35,000 for being Houston’s first bonus baby. He used part of it to purchase a large insurance policy. He also paid off his parent’s medical bills. The rookie pitcher started his professional career with the Jacksonville Jets of the SALLY League. In this first start, David tossed a one-hitter while striking out twelve. At the conclusion of their season he moved up to the Houston Bluffs (AAA) for their playoff run. At first, Dave couldn’t decide whether to sign with Houston or St. Louis, who had also shown interest in him. When the Cardinals hesitated, Giusti chose the expansion team. Dave believed that signing with Houston team was a quicker way to the majors than joining an established team like Cardinals. The young pitcher also juggled two careers; he also taught high school science while pursuing a master’s degree in physical education during the off-season. Cooking is one of his main hobbies. He learned about nutrition while pursuing his master’s in physical education and still watches what he eats. Since he possessed a college degree, Dave gave himself three to four years to make it. If baseball didn’t work out, he had another career to fall back on. A college education wasn’t all Dave acquired at Syracuse. He also learned how to throw the palm ball. While in high school he relied mostly on the fastball but learned that he couldn’t win in pro ball at any level with only one pitch. So Dave began using the palm ball in college along with a curve and straight change. Giusti thought learning the palm ball, which he picked up from Syracuse pitching coach Ted Kleinhans, was a matter of survival. Jim Konstanty, a Syracuse graduate and the 1950 NL MVP, also threw it. Dave claims to have used it 30-40% of the time. Giusti started the 1962 season in Houston (2-3, 5.62) but finished with Triple-A Oklahoma City. On September 19, 1962, he had bone chips removed from his pitching elbow at Houston’s Methodist Hospital. The operation was a success. The young pitcher spent all of 1963 and most of 1964 at Oklahoma City. During that time he married the former Virginia Lee Frykman, his college sweetheart, on October 26, 1963 in Oklahoma City. They met when she was a freshman at Syracuse and Dave was working on his master’s. While Dave was laying the foundation for his major-league career, the footings were being poured for the brand-new domed stadium in Harris County. It became known as the Houston Astrodome. His manager for the Oklahoma City 89ers was Grady Hatton, who was also his future manager in Houston. Oklahoma City won the PCL Championship their first in 28 years. Dave finished with a 13-11 record. He started with Houston in 1964, appearing in five games before returning to the 89ers, then returning for three games in September. Giusti started the 1965 season in Houston. The Astrodome would also open the season in Houston on April 12, 1965. Dave got a huge break when Don Larsen was traded to Baltimore, providing him with the opportunity become the team’s fifth starter. His first start was on April 26th. He shut out the Pirates 2-0 on four hits in his first major league start since 1962. Dave won his first four starts, and the Astros went on a ten-game winning streak until May 2nd. Although he began the year at 6-0, the young pitcher was plagued with bouts of inconsistency. Giusti finished the season at 8-7. The following three years, 1966-68, established Dave Giusti as a mainstay for a fine young pitching staff that featured Mike Cuellar, Larry Dierker, Chris Zachary, and Don Wilson. In a conversation with this writer, Giusti said the Astros’ pitching was excellent; the problem was a lack of offense. Manager Grady Hatton tried a non-traditional lineup, one that had his fastest men slotted in the first four spots. This idea produced minimal success. Dave had a “coming of age” season in 1966. He compiled a 15-14 record with a 4.20 ERA. The Astros finished in eighth place at 72-90, ahead of both the Cubs and Mets. Giusti pitched his best game of his career that season. On August 13, 1966, at Candlestick Park in San Francisco, Giusti faced Giants ace Juan Marichal and came one pitch away from hurling a no-hitter. The only batter to reach base was Cap Peterson, who hit a two-out single up the middle in the second inning. After that, Giusti retired the last twenty-two batters. Dave recorded four strikeouts. The game marked the first time Houston won at Candlestick Park that season. The gem was his high water mark as he won only three more times out of his last eight decisions. The Astros added Eddie Matthews and Bo Belinsky in 1967. Dave started the season with tendonitis, which explains his 0-5 record. On May 26th the Astros had their biggest run explosion of their short history, winning 17-4 over the Cubs. It was Dave’s first victory of the season. With tongue in cheek, his catcher John Bateman assured him after the game, “You see Dave, if you stick with me, I’ll pull you through.” His record after a poor beginning was 11-15 with an ERA of 4.18. Like Elroy Face, his predecessor on the Pirates, Giusti worked as carpenter during the off-season. He credited the trade with strengthening his arm and adding longevity to his career. After the 1967 season David and John Bateman installed cabinets in apartments. Giusti became the workhorse of the Houston Staff in 1968. He set a personal record for innings pitched with 251. Unfortunately, the Astros did not score a lot of runs, only 510. Dave was recipient of the team’s lack of offense. After Dave’s first ten starts he had an ERA of 1.76 but only a 4-5 record. Giusti had six complete games during that streak. Dave experienced hard luck on May 14th, a two-hitter that he lost to the Giants. He felt a bad call contributed to that defeat. In the fourth inning the umpire decided that Dave Marshall was hit on the knuckles, Giusti felt differently. Marshall went to third on a single by Mays and scored on a McCovey sacrifice fly. He felt that it was the turning point. Frank Johnson socked the first homer of his career to win in the fifth inning as the Giants won 2-1. He also lost to Don Drysdale 1-0 on May 18th. Dave had a no-hitter going on May 22nd with two out in the eighth against the Reds at Crosley Field. Pete Rose lofted a fly ball down the left field line; Jimmy Wynn raced over, caught it in the webbing, only to have his knee kick it out! Vada Pinson hit a double in the ninth, so he ended up with a two-hitter, winning 1-0. There wasn’t a single .300 hitter in the Houston starting line-up in 1968. Rusty Staub came the closest at .291. None of the starting pitchers had a winning record. Major League Baseball held the second expansion draft in its history. The newcomers to the National League were the Montreal Expos and the San Diego Padres. Their draft was held on October 14, 1968. The American League added the Kansas City Royals and Seattle Pilots. One week before the draft the St. Louis Cardinals traded Johnny Edwards to Houston for Giusti (others players were involved) but then left him unprotected for the draft. Instead they decided to protect Ted Simmons, Mike Torrez, and Joe Hauge. The Padres drafted Dave at number three. This was the second time Giusti was involved in an expansion draft. Coincidentally, Houston and St. Louis played a role in the 1961 draft. At that time, the Cardinals delayed in signing him causing Dave to sign with Houston. When David was drafted in 1961, he was twenty-one and could not afford to spend many years in the minors. In 1968, he was going to be twenty-nine, and pitching for another expansion team was not appealing. Fortunately his career in San Diego was short-lived. He never threw a pitch in a Padre uniform. After the 1968 World Series, the Cardinals traded Dan Breeden, Ed Spezio, Ron Davis and minor leaguer Phil Knuckles for him. Giusti was once again a member of the St. Louis Cardinals. On November 13, 1968, the Giustis became the proud parents of Cynthia Lynn, their second daughter. So Dave started 1969 with both a new daughter and team. The run support in St. Louis was no better than in Houston. The Cards provided him with only four runs during his first three starts. Still, he managed two victories. Lack of run support was frequent for Dave. Between the Cardinals’ offensive woes and a back injury caused during a game of pepper, Giusti did not win another game after May. He finished at 3-7 and 3.61 ERA. The Pirates intended to use their new pitcher as a starter. Unfortunately, Giusti had a horrible spring training and couldn’t get anyone out. Dave wasn’t worried about making the team but still felt concerned. When bullpen ace Chuck Hartenstein faltered, Murtaugh decided to give Giusti a try as the closer. At first Giusti wasn’t pleased with his new team’s plans for him in the bullpen. “I want to be in the starting rotation. I think I am a better pitcher if I’m used in the rotation.” His philosophy was “The way to make money in this game is to pitch a lot of innings. If you pitch enough innings, the wins will come. I’ve never set any victory goals for myself. I don’t believe in worrying about a won-loss record. If you pitch enough and pitch well, you’re bound to win. Of course luck has a lot to do with it.” Nevertheless, he accepted his new role. The Pirates clinched the Eastern Division on September 27, 1970, by beating the New York Mets 2-1. Dock Ellis was the winning pitcher, and Dave Giusti came in with one out in the eighth to save the game. Giusti finished the season with a record of 9-3, a 3.06 ERA and 26 saves. Pittsburgh finished at 89-73 but lost to the Cincinnati’s “Big Red Machine” three games to none. In 1970, Bob Gibson ran away with the Cy Young voting, but Giusti garnered eight points and finished fourth in the voting. At that point, no relief pitcher had ever won the Cy Young Award, although Jim Konstanty, a relief pitcher for the 1950 Phillies, won the N.L. MVP award in 1950. The Pirates would play the San Francisco Giants, who clinched the Western Division on September 30th to determine the National League pennant. The NLCS began on October 2, 1971, at Candlestick Park. Steve Blass faced Gaylord Perry in game one. Pittsburgh jumped out to a 2-0 lead in the third. Blass recorded nine strikeouts over the first five innings. He would fall apart in the fifth. First, Chris Spier singled, Gaylord Perry sacrificed, and Ken Henderson moved the runner to third with a ground out. Tito Fuentes hit a two-run homer. McCovey, Blass’ nemesis added a Herculean homer increasing the score to 5-2. The Pirates battled back in the seventh but still lost 5-4. Giusti pitched the eighth inning, giving up a hit and a walk while recording a strikeout. Game Two was played on October 3rd, and Bob Robertson hit three homers, leading the Pirate to a 9-4 victory. Dock Ellis was the winning pitcher. Giusti tossed a shutout ninth inning to close the game. Game Three moved to Three Rivers Stadium. Bob Johnson bested Juan Marichal 2-1. Robertson hit his fourth homer of the playoffs. Dave came in to shut the door with a shutout inning while picking up the save. Game Four featured a rematch of Perry and Blass. Blass struggled giving way to Bruce Kison. The Pirates scored four in the bottom of the sixth to make it 9-5. Guisti came in with two outs in the seventh shutting them out the rest of the way. The Pirates returned to the World Series for the first time since 1960 to face the Baltimore Orioles. Giusti became the first pitcher to pitcher to pitch in every game of the National League Championship Series. He appeared in four games for five and a third innings, giving up one hit, two walks, and three strikeouts for an ERA of 0.00. The odds-makers made the Orioles the heavy favorite to win the World Series. The Orioles’ pitching staff featured four 20-game winners. But it was the pitching of Blass, Briles and Kison that won the World Series for Pittsburgh. Dave pitched in three of the games, game two, four and six. He recorded a save by relieving Kison in game four. The Pirates won their first World Series since beating the Yankees in 1960. After the 1971 season, Dave Giusti was awarded the NL Fireman of the Year Award. He led the NL race from start to finish with 30 saves and 5 victories. Giusti started off slow in 1972, but by the All-Star break he was saving games and had an ERA a little over 2.00. Once again, Giusti was not named to the All-Star game. This time he was passed over by Murtaugh, his old manager who came out of retirement to manage the game. Dave was thankful to Murtaugh for extending his career by making him a reliever but was miffed and did not understand the decision. Dave had another standout season in 1972 and finished third in the NL with 22 saves and an ERA of 1.93. The Pirates also had a successful season winning the Eastern Division for the third straight year. They met the Cincinnati Reds for the NL pennant. The Pirates lost 3 games to two. Dave Giusti appeared in three games, saving game three and losing game five. On October 11, 1972, in Cincinnati, Steve Blass faced Don Gullet. Blass went into the eighth leading 3-2. Johnny Bench was due to lead off the ninth. Bill Virdon brought in Giusti, his bullpen ace. It was the bottom of the ninth, Pirates up 3-2, when Johnny Bench stepped up to the plate. The count was one ball, two strikes when the next pitch created the biggest disappointment of Giusti’s career. Tony Perez followed with a single up the middle. Sparky Anderson inserted the speedier George Foster to run for him. Guisti allowed a single to Menke. Then he went up 2-0 to Cesar Geronimo. Virdon went to his bullpen and brought in Bob Moose. He got him to fly out sending Foster to third. Darrel Chaney popped out to short. Anderson pinch hit McRae for Clay Carroll. Moose took the count to 1-1, and then went with his slider. It got past Sanguillen allowing Foster to score the winning run and the Reds won the pennant 4-3. That New Year’s Eve the greatest tragedy in Pirate history occurred. The plane that Roberto Clemente was on crashed shortly after its take-off from Puerto Rico, and he was never found. The Pirate star was taking supplies to earthquake victims in Nicaragua. Many of the Pirate veterans attempted to step up with hopes of filling the gap left by the superstar’s death. They found a one-two punch in their bullpen, Ramon Hernandez from the left and Dave Giusti from the right. On July 8th, Giusti’s personal streak of eleven victories (with 28 saves) since May 27, 1972, ended in Los Angeles with a 3-2 Dodger’s win. Like so many times before, he entered the game in the eighth inning for Dock Ellis. Willie Davis clouted a 12th inning home run. Before that, he pitched four scoreless innings retiring twelve men in a row. His record fell to 5-1. After being snubbed from the All-Star team for various reasons, Dave was selected by Sparky Anderson for the fortieth Mid-Summer Classic in Kansas City. The National League won 7-1. He pitched the seventh inning, yielding no hits or runs. That September Virdon was fired and replaced by Danny Murtaugh on September 7th. Unfortunately, the Pirates were unable to catch the New York Mets and finished 80-82, 2 ½ games behind in third place. Giusti had another strong year, finishing 9-2 with a 2.37 ERA and 20 saves. Dave Giusti turned 35 in 1974. He became the first relief pitcher in the major leagues to earn a $100,000 a year. Dave finished with a respectable record of 7-5. 3.32 ERA and 12 saves placing him as the all time National League leader with 110. The Pirates returned to the top of the NL East with an 88-74 record, finishing 1½ games ahead of St. Louis. They lost to the Dodgers three games to one. Dave appeared in three of the four games. He pitched 3.1 innings, giving up 13 hits, surrendering 8 runs and being charged with the loss in the second game. His elbow bothered him towards the end of the season. Dave elected to have surgery. The Pirates still considered Giusti a big part of their 1975 squad. Pittsburgh started its season in Chicago on April 10th. Dave was the winning pitcher. He earned his first save on April 20th against St. Louis. His elbow began stiffening. Dr. Albert Ferguson informed the reliever that nothing was seriously wrong and he pitched well. The Pirates won the Eastern Division and went on to play Reds. Dave appeared in the third game, pitching 1 1/3 innings, giving up no runs or hits. His season totals were 5-4, 2.95 ERA with 17 saves. The 1976 season was Giusti’s worst. He finished with a 4.32 ERA in 40 games and saved only six. The Pirates finished in second, nine games in back of Philadelphia. Giusti was dealt to the Oakland A’s with Doc Medich, Doug Bair, Rick Langford, Tony Armas and Mitchell Page for Phil Garner, Tommy Helms and Chris Batton on March 15, 1977. Dave put together a respectable 3-3, 2.98 ERA and six saves in 40 games for the A’s. Oakland sold him to the Chicago Cubs on August 5th. He appeared in 20 games, had a 0-2, 6.04 ERA and one save giving him 145 for his career. After his baseball career, Dave went to work as a salesman for Jack Piatt at Millcraft Industries, a company that specialized in industrial fabrication. He made sales calls around the Pittsburgh area from 1978 to 1981. Later he enjoyed a successful career at American Express as a corporate sales manager before retiring in 1994. Dave and his wife Ginny live in Upper St. Clair, Pennsylvania. Steve Blass, his former roommate and very close friend, lives near by. The Giustis spend time traveling and visiting their daughters Laura and Cynthia and four granddaughters. He continues to have strong ties with the Pirates’ organization. He serves as the vice president of the Pirates Alumni Association. Dave enjoys cooking, golf, and being a loving grandfather. Dave Giusti was a pioneer of the modern-day closer and redefined that aspect of the game. Those who followed him owe him thanks. Finoli, David, and Bill Ranier. The Pittsburgh Pirates Encyclopedia. Champaign IL. : Sports Publishing, 2003. O’Brien, James P. We Had ‘Em All the Way: Bob prince and his Pittsburgh Pirates. James P. O’Brien Publishing.